Over the years I’ve lost many plants and pounds of produce from my home garden to hungry white-tailed deer. A two-strand solar-power electric fence did a pretty good job for four years but last year several deer got in and did a number on the tomato, pepper, and Swiss chard. The current was not terribly strong and I was not consistent in using repellents and attractants to increase the fence’s effectiveness. I decided to build a more permanent fence in 2010 but plans had to be delayed till late summer or fall. So I decided to try monofilament (fishing line) in the interim- something I had read about on some web sites. It’s worked perfectly for the past six weeks, although the idea of counting on four or five strands of fishing line to protect my garden is scary. I hear you Tara. I see this as a temporary solution. I hope I don't have to post a photo of my garden decimated by deer! best hope for you with your fishing line fence against the deers. By experience this king of fence doesn't prevent birds to feed on my blueberry plants. 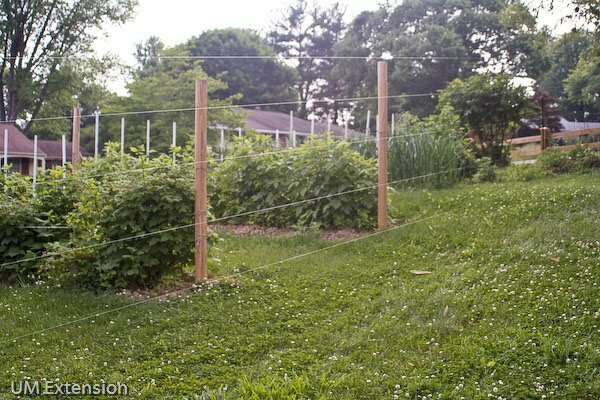 Please update us from time to time, Jon, about how your fishing-line fence works to keep deer out of your garden. I've used several kinds of plastic fencing, but our bambits have always found a way to defeat me. But maybe your single strands of fishing line will make the difference. That would be a great saving in fencing, with 36″ welded wire fencing cost $25 or more per 50 feet. 15# test is pretty light line. You could use 50# test to make a stronger fence. Regardless, you'll need at least a 7.5 foot fence if your using a single fence or you can use two shorter parallel fences spaced about 2 feet apart. Hi Anonymous – there was an update to this post at http://groweat.blogspot.com/2010/07/oh-deer-fishing-line-fence-revisited.html – conclusion, not all that well. This is so helpful, thank you! I've been dreading shelling out $600 on deer fencing and was desperate for an alternative. How did you make a gate? Or how would you suggest making a gate that has a 6ft opening? I have two large posts that frame the opening. Mine is only wide enough for a wheelbarrow to get through- about 30-in. wide. It's a simple wood gate covered with chicken wire. How do you get in and out of the garden area? Are you cutting the line each time? I have a gate that deer can't hop over. The fishing line begins at one of the gate posts and ends at the other.